Disavow Links Tool Just A Trick? Backlink Paranoia!! 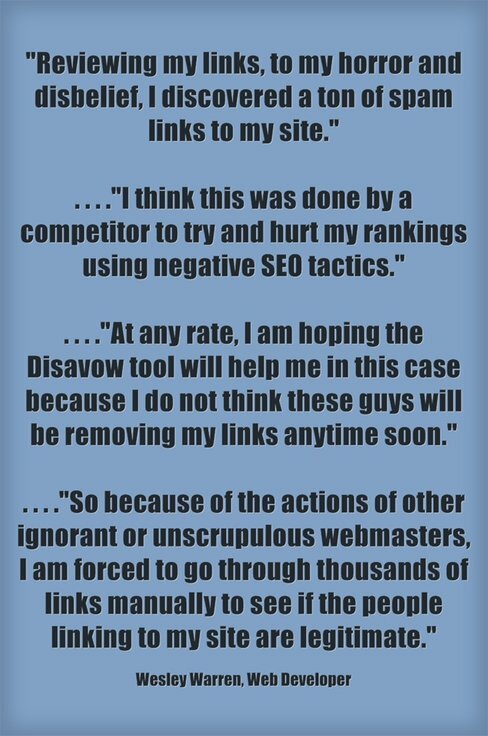 - Is Google's Disavow Links Tool Just A Trick? OK. OK!! I confess. The content of this post was provoked by my reading two exact opposite recommendations by SEO authorities about what to do with bad backlinks to your site(s). First let's deal with info from two SEO gurus Andre Voget and Johannes Selbach. Believe me I didn't get a good feeling reading their conclusions. I got a sick feeling. 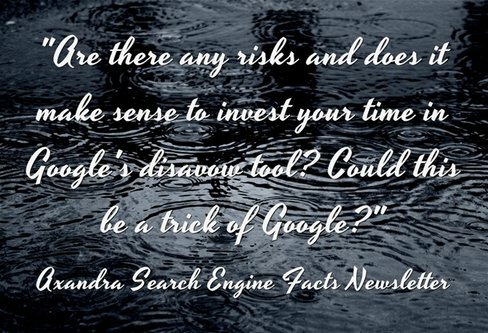 Is Google's Disavow Links Tool Just A Trick? Its bad enough that Google is tracking our every backlink move. According to the professional web developer, Wesley Warren, we also have to worry about the negative SEO practice of the link spam attack. Warren printed an article recently on the Search Engine Journal website. He detailed the extensive problems he had when one of his major sites was penalized after last year's Penguin update by Google. Its very instructive to read Warren's complete article, because he comes to very different conclusions regarding Google's Disavow Links Tool. OK. If you're still with me, how do we resolve this conflicting advice?? Drastically reduce reliance on Google for traffic. MUST DO! But my final recommendation is to concentrate on developing quality backlinks from authority sites. I recently recommended Jack Humphrey generous offer of a free download for his web traffic classic, Bending The Web. Implementing Jack's strategy will result in an abundance of high quality links from status and authority sites, plus huge increases in website traffic.